Whether you call them by the term bums or the more forgiving “the homeless,” the streets of Southern California are filling up with raggedy men (and some women) who are living off the streets, They like to position themselves near markets and convenience stores and ask for the inevitable “spare change.” Across the street from where I live, there are several more-or-less permanent tents where several bums (yeah, these guys are properly called bums) spend the night, howling at the moon. 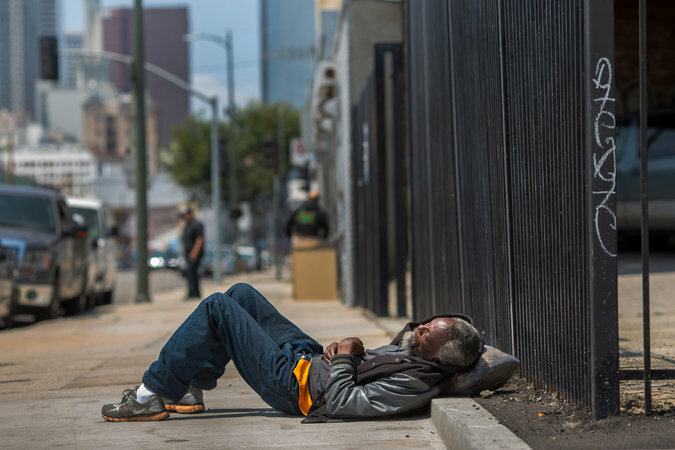 There are food distribution programs that cater to L.A.’s street people, but they still beg for spare change. My theory is that the money they get is strictly for CBD—cigarettes, booze, and drugs. At least one of the bums across the street is a drug dealer: He has two cars parked on the curb and is frequently seen talking on a burn cellphone. I am somewhat torn. I like the idea of helping the true homeless—those who have some chance of getting out of their present dire situation—but I absolutely refuse to help bums. It’s like putting out a cockroach feeder. I support the Salvation Army and several other charities that help the homeless, but I would prefer that the bums move on elsewhere. I can hear them all night swearing loudly at each other and sometimes fighting in he street. Every once in a while, the LAPD stops and asks them to move on, but they cannot force them unless there is a clear violation of the law. In nearby Santa Monica, bums are not allowed to set up tents and sleep on the pavement; but Los Angeles has always been a bit more forgiving. In the meantime, there are breakins to the apartment laundry rooms where the perpetrators are searching for quarters. A neighbor’s bicycle was stolen; and other small crimes of the typr that did not happen until the bum encampment was set up.